"There's a new groove in town," says Casio. Casio is set to expand its XW range (we reviewed the XW-P1 synth a couple of years ago) with the XW-PD1, which is being teased in a print advert that's been scanned and has found its way online. 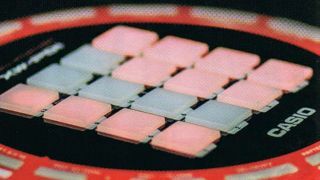 This features an image of the device that confirms that it's round and has 16 pads, with the words "There's a new Groove in town" and "Trackformer" suggesting that this will be a groovebox product. These are the only details we have at this stage - expect the full reveal at the NAMM Show later this month, with more information likely to appear on the Casio website.